Electrons exist in energy states within the atom (called orbitals by chemists). When an electron jumps between energy levels of an atom it either absorbs energy for the transition or emits a photon when reducing its potential energy. 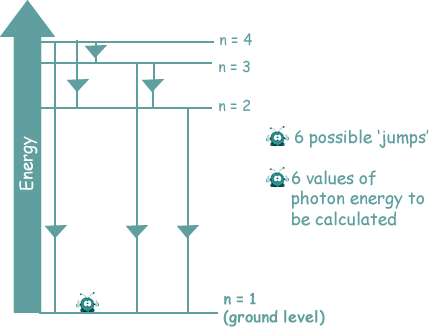 photon absorption - absorbing a photon of exactly the correct energy needed for a 'jump'. obtaining energy by colliding with a free electron. It will take just the amount of energy it needs for the jump from the free electron's kinetic energy. an electron can obtain energy from an electrical supply. W = QV, so an electron, having a charge 'e' will obtain energy of XeV if placed in an potential difference of X volts. This can be done by bathing the gas sample in electromagnetic energy of a wide continuous spectrum (usually of visible light - but it is the same principle for other sections of the electromagnetic spectrum - only then you wouldn't 'see' the result - you would need to use a detector). The electrons absorb the photons they need to make transitions to higher energy levels and then give them back out again when they return to the ground state. They only remain in an excited state for less than a microsecond and are therefore constantly absorbing/emitting photons from the electromagnetic source. Or it can be done by bombarding the atoms with electrons. They will then share their kinetic energy with the orbital electrons, causing them to be promoted. When they return to the ground state the electrons can do so by any path - jumping down any number of energy levels to get to the ground state. You may be asked to calculate the frequency or wavelength of the emitted photons. There are two type of atomic spectra. The graphic below shows the visible spectra for hydrogen. You can see that the lines are in the same place on both spectra - because they correspond to the same energy jumps. Photons that do not have energies that correspond to the 'gaps' between energy levels for the electrons are not absorbed. They go through the gas onto the photographic plate (or other form of detector). Click here for an interactive activity page on absoption spectra. Another way of exciting the electrons is electrically. By putting the gas in a discharge tube we can 'zap' the atoms and therefore their electrons with electrical energy. This promotes electrons from the ground state to excited states and then as they 'jump down' they emit the characteristic photons of the jumps within the electron orbital of the atom. These can be collected by a dispersion system such as a spectrometer (or prism) which will disperse them into wavelengths.... missing wavelengths will not appear on the film, gaps will be left. The only coloured lines will be those that correspond to the wavelengths of the photons that 'fit' the energy jumps between orbitals. The spectrum we see is called an emission spectrum. Click here for an interactive activity page on emission spectra. Click here for details as to how fluorescent tubes work. Click here to see an interactive application from Colorado Uni that allows you to see what happens in various models of the hydrogen atom. Click here to see how a discharge tube works.